Exodus 2:1-2 “Now a man of the tribe of Levi married a Levite woman and she became pregnant and gave birth to a son. When she saw that he was a fine child, she hid him for three months. The Israelites are being persecuted and Pharaoh has ordered his men to throw all of the Hebrew baby boys into the Nile River. This particular Levite woman looks are her son and sees that he is “fine” and decides to try and save him. My question here is what mother looks at her child and doesn’t think he is the best, most wonderful little being on this planet? When I had Fierce, one of the first things I said when they laid him on my chest covered in goo, was that he was beautiful. I wonder if there were more stories like this of other Hebrews trying to save their sons. I think it is plauseable, because in the previous chapter when Pharaoh ordered the Hebrew midwives to kill the baby boys, they didn’t and God rewarded them with families of their own. 1. His parents observed him to be a goodly child, more than ordinarily beautiful; he was fair to God, Acts 7:20. They fancied he had a lustre in his countenance that was something more than human, and was a specimen of the shining of his face afterwards, Ex. 34:29. Note, God sometimes gives early earnests of his gifts, and manifests himself betimes in those for whom and by whom he designs to do great things. Thus he put an early strength into Samson (Judge 13:24, 25), an early forwardness into Samuel (1 Sa. 2:18), wrought an early deliverance for David (1 Sa. 17:37), and began betimes with Timothy, 2 Tim. 3:15. 2. Therefore they were the more solicitous for his preservation, because they looked upon this as an indication of some kind purpose of God concerning him, and a happy omen of something great. Note, A lively active faith can take encouragement from the least intimation of the divine favour; a merciful hint of Providence will encourage those whose spirits make diligent search, Three months they hid him in some private apartment of their own house, though probably with the hazard of their own lives, had he been discovered. Herein Moses was a type of Christ, who, in his infancy, was forced to abscond, and in Egypt too (Mt. 2:13), and was wonderfully preserved, when many innocents were butchered. It is said (Heb. 11:23) that the parents of Moses hid him by faith; some think they had a special revelation to them that the deliverer should spring from their loins; however they had the general promise of Israel’s preservation, which they acted faith upon, and in that faith hid their child, not being afraid of the penalty annexed to the king’s commandment. Note, Faith in God’s promise is so far from superseding that it rather excites and quickens to the use of lawful means for the obtaining of mercy. Duty is ours, events are God’s. Again, Faith in God will set us above the ensnaring fear of man. 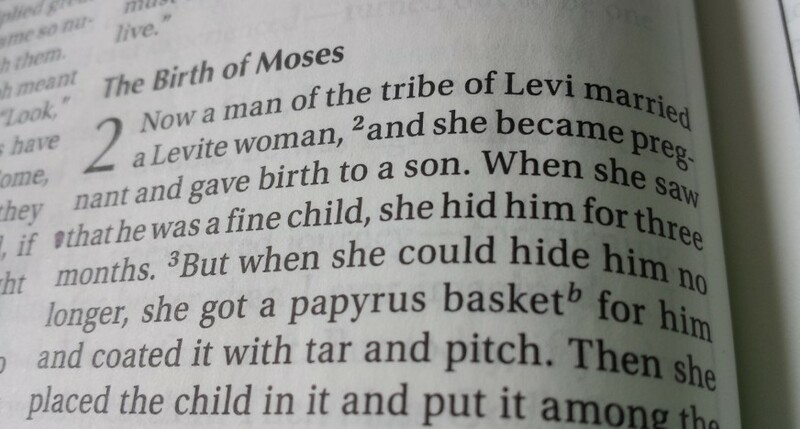 After reading this and also Acts 7:20 “At that time Moses was born, and he was no ordinary child.” Therefore, not only was Moses beautiful in his parents eyes, but they also saw that he was not ordinary and had a special purpose. I find it fascinating that there was a physical manifestation of the plan God had for Moses.